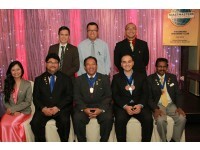 THE Brunei Speakers’ Club (BSC) on August 17, 2012 held their annual installation night, whereby the previous executive committee members pass on the gavel to the newly elected members who will take up the office for the next year. The newly elected President is Ali Imran Osman, Vice President of Education is Refana Mohd Juanda, Vice President of Marketing is Athimoolam Morgen, Vice President of Public Relations is Del Goh, Treasurer is Bing Leh Ling, Secretary is Siti Intan Dolrani, and the Immediate Past President who will continue to give his support to the growth of the club is Shawn Cassidy Narcis. Present at the dinner to swear in the new executive committee members was the Area Governor of K6, Tazio Lai; as well as the Division K (includes Brunei, Sabah, and Labuan) Governor, Shawn Cassidy Narcis. He also highlighted that the vision of the BSC is to develop creative leaders of tomorrow, leaders not only of the people around them, but also a leader of their own lives. On their upcoming agenda, BSC will be organising the District 87 Toastmasters 3rd Semi-Annual Convention 2012 on November 9 to 11, 2012 and will play host to other international toastmaster members from the region. The Brunei Speakers’ Club meet every Tuesday night at the Semeo Voctech at 7.30pm and welcome anyone who is interested to find out more. They also have a facebook page at www.facebook.com/bruneisc.